Fort Delaware is known to most Civil War readers as a prisoner of war facility, but it served in a coastal defense capacity from the early republic through the 20th century, obviously going through a sequence of renovations. With the outbreak of Civil War, it was a Third System star-shaped masonry fort with 47 guns, manned by a detachment of the 4th U.S. artillery. When the threat of Confederate naval attack up the Delaware River proved illusory, Fort Delaware's new role became one of POW camp, housing over 30,000 Confederates in total throughout the war years. Fort Delaware, part of Arcadia Publishing's Images of America series, is co-authored by state park manager and historian Laura M. Lee and Ft. Delaware Society member Brendan Mackie. Their study is not a narrative history, but rather a story told through a variety of captioned images, from sketches, woodcuts, engineer drawings, and maps to the more numerous photographs of persons, buildings, and landscapes. Printed on glossy paper, the quality of the images is good. Most were obtained through the Society, but others are held in other public and private collections. Each chapter has a short introduction and the captions provide enough context to give readers a fine overall understanding of the persons, places, and events surrounding the fort's lengthy existence. The chapter covering the Civil War years is substantial, with an emphasis on the fort's capacity as a POW camp. Numerous photos of individuals and groups from both sides are included as well as photographic images and artist renderings of the fort itself, the prisoner barracks, and other buildings. This is the second Civil War related title I've read from this series, and both have proved to be worthwhile acquisitions. General readers as well as period photography enthusiasts should find this volume of interest. The aerial photos and detailed engineer sketches and maps should also be of use to students of 19th century brick fortifications. Perhaps it is still too early yet for such announcements (and I suspect that might be so with today's short attention spans), but, if building anticipation is an important goal in publishing, no one has really started yet. Symonds (ed. ): "UNION COMBINED OPERATIONS IN THE CIVIL WAR"
The ten essays presented in Union Combined Operations in the Civil War spawned from a conference at the Mariners' Museum in Newport News, Virginia. In contributor and general editor Craig L. Symonds's introduction, he raises critical operational, organizational, and leadership issues that popped up again and again during the Civil War, one or more of which made the difference between success and failure in a long string of Union combined operations spanning the entire war. These are a lack of unified command, flaws in communication, and absence of doctrinal structures for defining areas of responsibility. At their core, the defining feature of successful operations were cordial cooperation between local army and navy heads, simple to ask for but immensely difficult to execute. Symonds also mentions the only book to study Union combined operations as a whole, Rowena Reed's Combined Operations in the Civil War (1978), which he believes promoted valid points but was nevertheless seriously flawed by the author's enamorment with the genius of General George McClellan. The first two chapters deal with the 1862 Burnside expedition that captured much of Confederate North Carolina's seaports, forts and coastline. David Long's essay is more of a descriptive account, one that demonstrates Ambrose Burnside able planning, organizing, and execution of the wildly successful campaign, as well as the general's smooth working relationship with his naval counterpart. David Scaggs's follow-up is more of an analytical piece, arguing that historians have not appreciated enough the strategic possibilities of Burnside's occupation of eastern North Carolina. While he, like Rowena Reed, appreciates McClellan's strategic vision on the matter, he is critical of the general's refusal to detach from the main army the men and resources required to advance and hold indefinitely inland points astride enemy lines of supply and communication in North Carolina. However, much of this line of argument is flawed. Before assigning all the blame to McClellan, perhaps a re-examination of the timeline is in order. Lincoln relieved McClellan of his duties as general in chief (reverting the general to command of the Army of the Potomac only) on March 11, a date by which Burnside had not yet captured even New Bern, Beaufort, and Fort Macon (which fell on April 26). Thus, perhaps it is a bit unfair to hold McClellan solely or even largely responsible for unwillingness to exploit Burnside's gains. By the time of the Civil War, there was no body of officers specially trained in planning and coordinating combined operations, but Mark Snell's piece highlights the impressive performance of engineering officer Major Barton Alexander, the central figure in the successful amphibious operation at Eltham's Landing during the Peninsula Campaign. Snell notes that, in addition to excellent leadership at the subordinate level, sea-land communications were unusually effective during the landing. For the same campaign, Robert Sheridan offers his analysis of the Drewry's Bluff battle, one that failed because it was not conceived as a combined operation (difficult as that maybe have been given the distance involved and force required to maintain the position). John Fisher's essay summarizes Union combined operations along the length of the Texas coastline, reinforcing a central theme of the book that the single most important factor determining success or failure was the level of cooperative spirit between army and navy commanders. Of course, Confederate weakness always helped, and Union efforts in seizing the barrier islands and the mouth of the Rio Grande River benefited from this. Francis DuCoin's Charleston article also highlights failure as a consequence of interservice jealousy and lack of cooperation. The army-navy command teams of Hunter-Du Pont and Gillmore-Dahlgren could never see eye to eye or subordinate personal prerogatives enough to exploit the several reasonable opportunities to capture the city that arose between 1861 and 1863. However, some progress was made, with Craig Symonds's article finding that some of the institutional barriers to unified command were breaking down by the end of the war. Along the James River in 1864, navy commanders were allowing themselves to be directed by Grant. Increased late-war efficiency is also demonstrated in Chris Fonvielle's chapter, where failure in 1864 was converted to ultimate success in 1865 with the capture of both Fort Fisher and Wilmington; but, once again, command change rather than structural or doctrinal improvement was the leading factor. In his chapter assessing British reactions, Howard Fuller found that their analysis of U.S. Navy attacks on fortified Confederate cities, most particularly Charleston, led the Royal Navy to reassess its own strategy of relying on its deep water fleet capability for rapid, decisive strikes against enemy coastal targets. However, while reports about the success of American fortifications, heavy guns, and obstructions raised concern, none of this was enough to spark British development of littoral strike forces. The old system was sustained. Finally, Edward Wiser concludes the volume with a fine essay contextualizing the Union's Civil War land-sea effort within the entire length of U.S. military history, citing the failure to create any kind of institutionalized combined operations doctrine, even after witnessing the effectiveness of the Vera Cruz landing in 1847. Perhaps its profound success made leaders complacent. Wiser also does a good job of recapping the problems raised in the previous essays. He also goes further than any of the others in citing Lincoln's failure to develop a unified command structure for combined operations and the seriousness of its consequences. The president clearly saw the problem personally on the James River in 1862, yet did nothing to change it. It was a major failure on the part of the commander-in-chief, and lack of precedent cannot be an excuse as Wiser cites temporary codified army-navy command arrangements that were developed during the War of 1812. According to the writer, there is simply no reason why a brilliant leader willing to aggressively push radical systemic changes on social and political fronts could not also have done so with the army and navy, yet nearly all historians of Lincoln as commander-in-chief give the president a pass on such a glaring failure. It's a powerful argument. Union Combined Operations in the Civil War is a most welcome set of essays, both a wide ranging general introduction to the subject and a series of deft analyses of specific joint actions. It is also an excellent example of effectively converting academic conference presentations into publishable essay form, a credit to Craig Symonds. This book is highly recommended. All of the Fall/Winter catalogs are pretty much out by now. In terms of books that interest me directly, it's not fat pickings, but there will certainly be more coming as many are not announced far in advance. * Stoneman's Raid, 1865 by Chris J. Hartley (John F. Blair). Check out the table of contents from the linked page. It looks great, and, in the meantime, you might check out the author's Blue and Gray Magazine feature article and General's Tour on a portion of the raid. * Summer Thunder: A Battlefield Guide to the Artillery at Gettysburg by Matt Spruill (U. of Tenn Pr). Online sources have this for a mid-August release, the publisher mid-September. * Failure in the Saddle: Nathan Bedford Forrest, Joe Wheeler, and the Confederate Cavalry in the Chickamauga Campaign by David Powell (Savas Beatie). * The New York Times The Complete Civil War 1861-1865 edited by Holzer and Symonds (Black Dog & Leventhal). This book and DVD combo will be a valuable reference book, with 600 articles reproduced in print and 139,000 more articles -- the complete Times run -- in the digital companion. I would never have guessed anything approaching that number. The newspaper maps will be included, as well. * Into the Crater: The Mine Attack at Petersburg by Earl Hess (U. of SC Pr). * The Day Dixie Died: The Battle of Atlanta by Gary Ecelbarger (Thomas Dunne/St. Martin's). Finally, a full length battle history from this campaign. * Railroads of the Civil War: An Illustrated History by Michael Leavey (Westholme). * Border War: Fighting over Slavery before the Civil War by Stanley Harrold (U. of NC Pr). * Crossroads of Conflict: A Guide to Civil War Sites in Georgia by Brown and Elwell (U. of Georgia Pr). I'm hoping the coastal sites get a lot of attention. * A Civil War Gunboat in Pacific Waters: Life on Board the USS Saginaw by Hans Konrad Van Tilburg (UP of Florida). The archaeological-historical studies from UPF (at least the ones I've read) are always good. * The Notorious "Bull" Nelson: Murdered Civil War General by Donald A. Clark (SIU Pr). * I Will Give Them One More Shot: Ramsey’s First Regiment Georgia Volunteers by George W. Martin (Mercer U. Pr). A mega regimental of a one-year unit that fought in theaters of great interest to me. * Lincoln and Citizens' Rights in Civil War Missouri: Balancing Freedom and Security by Dennis K. Boman (LSU Pr). * Kansas's War: The Civil War in Documents by Pearl T. Ponce (Ohio U. Pr). * The Civil War in Mississippi: Major Campaigns and Battles by Michael B. Ballard (UP of Mississippi). 1. Confederate Generals in the Western Theater, Vol. 2: Essays on America’s Civil War edited by Lawrence Lee Hewitt and Arthur W. Bergeron, Jr. (Univ. of Tenn. Pr, 2010). A close follow up to Confederate Generals in the Western Theater, Vol. 1: Classic Essays on America’s Civil War, the second volume in the series has ten original articles. Generals examined are George Crittenden, Alfred Vaughn, Earl Van Dorn, Joe Johnston, James Longstreet, Braxton Bragg, A.P. Stewart, William Hardee, Hylan Lyon, and John Bell Hood. 2. 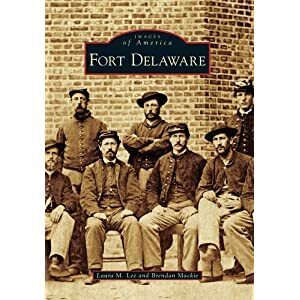 Fort Delaware by Laura M. Lee and Brendan Mackie (Arcadia Pub, 2010). Part of the publisher's Images of America series, this is not a narrative history but a collection of captioned photos, drawings, and maps. Wood: "THE TWO CIVIL WAR BATTLES OF NEWTONIA"
Nexus of at least a half dozen roads, and with a location in close proximity to the lead mines at Granby, it is no surprise the southwest Missouri town of Newtonia was the site of a pair of sizable Civil War battles. The First Battle of Newtonia (September 29-30, 1862) has received some attention in the literature, from contemporary Wiley Britton to modern historians Ed Bearss and Michael Banasik. Compared with the earlier fight, the second battle, fought on October 28, 1864 near the conclusion of the Price Raid, has been largely ignored by writers. Both are covered in Larry Wood's new book The Two Civil War Battles of Newtonia, part of the History Press's Civil War Sesquicentennial Series. The First Battle of Newtonia erupted on September 29, 1862, when a small Federal reconnaissance foray was turned back by superior numbers of Confederates. Both sides were reinforced before and during the larger clash on the 30th, leading to something of a see-saw action pitting division-sized forces against one other. Two chapters cover the morning and afternoon phases of the battle, the end result of which was a Confederate victory. Wood's tactical account of the fighting bores down to company and regimental level movements, and is sufficiently detailed. While experienced readers will find the narrative mostly familiar, there are fresh bits and pieces scattered about, especially those sections dealing with the civilian experience. The Second Battle of Newtonia was an all cavalry affair, fought when the rear guard of General Sterling Price's army under Jo Shelby turned to face their Union pursuers. The Confederates were eventually forced to withdraw in the face of federal reinforcements. Wood's description of this battle, while relatively brief, is the most detailed I have encountered in the published literature. Also provided is a chapter tracing the Union occupation of Newtonia during the period between the two major battles by a series of Missouri State Militia units. A noteworthy aspect of the first battle was the employment of Indian regiments by both armies, and Wood discusses the roots of the factionalism present among tribes located in the Indian Territory (specifically the Upper and Lower Creeks and the treaty and non-treaty Cherokee parties) that eventually led them to opposing sides in the Civil War. For readers unfamiliar with the subject, the author also briefly summarizes the 1861-62 campaigns fought in the Indian Territory and southwest Missouri. A final chapter highlights preservation efforts. A strength of the book is the cartography, which is satisfactory in both number and level of detail. Though composed of simple line drawings, all relevant terrain features are present in the maps and troop movements and positions are traced at short intervals. Period and modern photographs are also sprinkled throughout the text. However, there are issues of concern. Wood's writing does have some minor errors [e.g. the author continually refers to Lower Creek leader Chilly McIntosh as "Chitty" McIntosh, presumably a holdover from Britton] that escaped final editing and the text unfortunately lacks footnotes. Also, the limited bibliography references only a handful of unpublished materials, mostly from the University of Missouri's manuscript collections at Columbia and Rolla, with the rest published sources of all types. Nevertheless, The Two Civil War Battles of Newtonia is a recommended volume for any reader interested in the battles and campaigns fought inside Missouri, and Wood's narrative comprises arguably the best work on the Newtonia battles to date. Those with a specific interest in the Indian as participant will also find the book to be of value. The Arkansas Historic Preservation Program E-Newsletter is a great regular source for Civil War news from the state. The latest one (7/21) includes a link to the complete published report [a large 139 page .pdf file] for a Camden Campaign preservation plan. At least for me, with this paper, the battlefields of Elkin’s Ferry, Prairie D’Ane, and Moscow Church are specifically located and mapped in published form for the first time. [So far, the best narrative account of this campaign remains Michael J. Forsyth's The Camden Expedition of 1864 and the Opportunity Lost by the Confederacy to Change the Civil War (Ed Bearss's out of print Steele's Retreat from Camden and The Battle of Jenkins' Ferry covers only the latter part of the campaign)]. Speaking of Arkansas related battles and books, congratulations are in order to Mark Christ, whose Civil War Arkansas 1863: The Battle for a State just won the 2010 Douglas Southall Freeman History Award. 1. The Mechanical Fuze and the Advance of Artillery in the Civil War by Edward B. McCaul, Jr. (McFarland, 2010). McCaul's book appears to be his dissertation, a technical treatise on shell fuzes. Being only familiar with the major type names and some general characteristics, this should be an education. Craig will probably be interested, too. 2. Double Death: The True Story of Pryce Lewis, the Civil War's Most Daring Spy by Gavin Mortimer (Walker & Co., 2010). A native Briton, Lewis was a Pinkerton agent operating in the eastern theater in the early months of the war before being captured by the Confederates. This is his story in a popular narrative format. 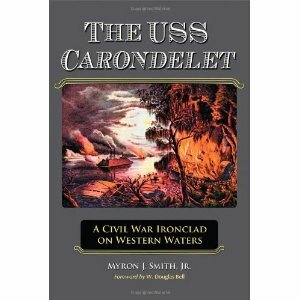 Smith: "THE USS CARONDELET: A Civil War Ironclad on Western Waters"
Reknowned for its daring nighttime run past the Island Number Ten defenses on April 4, 1862, the City Series ironclad gunboat U.S.S. Carondelet was perhaps the Union's most famous river gunboat in the western theater. In addition to authoring several major works on riverine warfare* before this one, Myron J. Smith published a design, construction, and personnel history of the vessel in 1969 (revised in 1982). Including even more operational history, The USS Carondelet: A Civil War Ironclad on Western Waters is a significant expansion of the author's previous work on the subject. Smith begins his new study with a pair of background chapters summarizing the planning and construction of the City Series ironclads. His discussion of life on board these gunboats is enhanced by a cache of previously unused manuscript material written by an ensign (Scott D. Jordan) serving aboard the Carondelet. The rest of the book is, like Smith's related works, a detailed operational history of the Carondelet's participation in many of the important campaigns fought in the western theater. It begins at Fort Henry and moves through Fort Donelson, Island Number Ten, Fort Pillow, Plum Run Bend, the action against the C.S.S. Arkansas, the Vicksburg Campaign, Red River, and Nashville. The final chapter discusses the vessel's 1865 decommissioning. It was laid up in ordinary before being finally sold and repurposed, ending its life as an undistinguished wharf boat on the Ohio River. Smith's text is supplemented by several published map reproductions, as well as numerous photographs and drawings of the ship in action. The endnotes in The USS Carondelet are expansive affairs, densely packed with citations, source interpretation, supplementary text, and background material. The large bibliography contains the full range of expected sources (manuscripts, government documents, newspapers, books, articles, theses, dissertations, and interviews), and the index is of the more helpful kind, with numerous subheadings and cross references. With four major works now published in as many years, Myron J. Smith has established himself as a leading authority on Union naval operations on the western waterways. None of these books are for the faint of heart, but, taken together, they comprise for the specialist a uniquely detailed and remarkably complete major operational history for the entire spectrum of Union gunboat classes. Additionally, the series provides much valuable insight into design issues, equipment, and personnel. The USS Carondelet and its predecessors are highly recommended. * - Tinclads in the Civil War: Union Light-Draught Gunboat Operations on Western Waters, 1862-1865 (McFarland, 2009), The Timberclads in the Civil War: The Lexington, Conestoga, and Tyler on the Western Waters (2008), and Le Roy Fitch: The Civil War Career of a Union River Gunboat Commander (2007). There are so many book prizes for which Civil War related books are eligible that I've given up trying to keep track of them all. However, a new one deserves mention. Kevin Levin mentioned the announcement on the UNC Press Blog of the inaugural winner of the Tom Watson Brown Book Award. Prof. Daniel ("I always have to go back and erase 'Donald'") Sutherland's A Savage Conflict: The Decisive Role of Guerrillas in the American Civil War is a wonderful book [see my review and interview] and its author is richly deserving of the award. With prize win announcements for fellow UNC Press authors William Shea (Fletcher Pratt Award) and Earl Hess (Harwell Book Award) undoubtedly fresh in his memory, I'll forgive UNCP editor-in-chief David Perry's outdated cliche statement basing part of the significance of Sutherland's win on his work not being a "book on a battle or a military leader" (as if those remain overrepresented on the major award circuit). $50,000 is a top level honorarium as Civil War book prizes go, and should give the new Watson Brown Award an immediate leap in prestige. That's good news for authors, as the field has long needed more inclusive Civil War history awards to match in at least monetary scale the heavily Abe-centered Lincoln Prize. White & Runion (eds. ): "GREAT THINGS ARE EXPECTED OF US: The Letters of Colonel C. Irvine Walker, 10th South Carolina Infantry, C.S.A." Great Things Are Expected of Us, a recent addition to University of Tennessee Press's wonderful Voices of the Civil War series, comprises an unusually detailed body of primary source material covering the major campaigns and battles of the western theater. Discovered by co-editor Charles Runion by happenstance on a visit to Charleston, South Carolina, the letters of Colonel Cornelius Irvine Walker were a fortunate find that will benefit many Civil War researchers and readers. Walker's writings are truly exceptional, and valuable, on several levels. The South Carolinian was an ardent Confederate that served as a brigade staff officer as well as a field-grade line officer for the 10th South Carolina infantry regiment. So, not only does he provide sociological insights into the mindset of that particularly enthusiastic generation of young Confederates of which he was a member, but his direct combat experience, combined with the wider perspective gained from a staff posting, allowed Walker to pen unusually lengthy and abundantly detailed battlefield accounts, all of which were regularly sent on to his fiance. The particular collection of Walker letters reproduced for this book are post war copies made by the author himself1, and are rendered unique by the voluminous annotations that serve to correct, clarify, contextualize, or simply expand upon points made in the original letters. Unfortunately, the collection was also self-censored, with much personal material excised and many full names omitted. However, through his own research and from clues provided, co-editor W. Lee White was able to retrieve many of these lost elements and make them available for the reader in his own endnotes, which also fulfill the other traditional note functions as well. With the omission of much the letters's personal nature, it is clear that Walker intended this particular compilation to serve a primarily military historical function. And what a record they are. For the 1862 Kentucky Campaign, interesting material about the capture of the Union garrison at Munfordville is presented, and, although Walker and the 10th missed the Battle of Perryville, the author nevertheless relates valuable information and insightful analysis about the general conduct of Bragg's advance and retreat. The notes and material covering the Battle of Murfreesboro are among the book's richest trove of information. Military students will also appreciate the series of letters dealing with Tullahoma, Chickamauga (but not much), Chattanooga, the Atlanta Campaign, and Hood's Tennessee Campaign2. Throughout his writings, even with defeat piling upon defeat, Walker remained a steady supporter of Army of Tennessee commander Braxton Bragg, frequently chastising critics as ignorant, and constantly urging his fiance to adopt his own views of the general. It is impossible to clearly determine the origins of such constancy3, but it is apparent that Walker truly admired Bragg's strategic sense and operational ability. He also spoke well of Beauregard. On the other hand, he could be scathing in his assessments of other high ranking officers, men like Thomas Hindman and John Bell Hood. Even the "abolitionist" Patrick Cleburne could not escape his ire. Ever the faithful Confederate, Walker fought to the bitter end in the Carolinas Campaign. Wounded at Kinston, he managed to return to the army for the final surrender, which he viewed at the time not as an end but as a temporary setback. 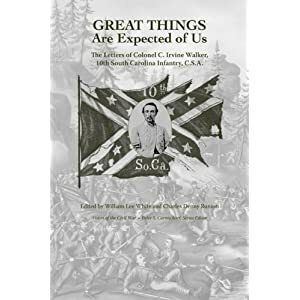 With the able work of editors White and Runion, Great Things Are Expected Of Us is really an extraordinary addition to the primary source material literature of the Civil War (especially its military aspects) and is highly recommended. 1 - The editors were not able to gain access to the originals -- perhaps a story in itself. 2 - An additional piece by Walker outlining his personal experience of Franklin and Nashville is included as an appendix. 3 - First impressions tend to last, and, according to the author, Bragg did immediately single out the 10th as a particularly well drilled regiment when the unit joined the western army. Williams: "MY OLD CONFEDERATE HOME: A Respectable Place for Civil War Veterans"
It has often been said that Kentucky joined the Confederacy after the guns fell silent. Their veterans were certainly not forgotten. Funded by a mixture of private donations and state monies and dedicated in 1902, the Kentucky Confederate Home, located 16 miles east of Louisville in Pewee Valley, housed hundreds of disabled and indigent veterans over its existence. 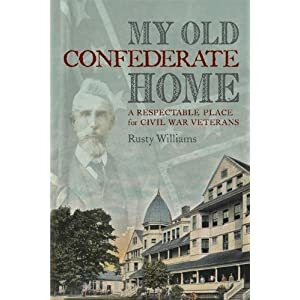 Rusty Williams's My Old Confederate Home: A Respectable Place for Civil War Veterans is a lively narrative history of the institution, interspersed with biographical sketches of its many inmates, administrators, staff, and major benefactors. The author's informal writing style is unusual for an academic press non-fiction title, progressing at a staccato pace with frequent single sentence paragraphs. It takes some getting used to, but one should not confuse informality with any deficiency in scholarship. Williams's research is thorough and his work fully documented. If any individual can be said to occupy a place at the center of the Kentucky Confederate Home, it would be Bennett Henderson Young, Kentucky United Confederate Veterans (UCV) leader and chair of the home's board of trustees. The former John Hunt Morgan and St. Albans raider was instrumental in fundraising, a combination of private subscription (mostly from veterans and their families) and state appropriation, and was a constant supporter of the institution until his death. The state deserves a great deal of credit for always responding to the home's financial needs, but Young was an extremely effective legislative lobbyist on the institution's behalf. He was also jealous of the board's prerogatives, often clashing with female groups (like the UDC). Though these generous women provided both donations and services, Young consistent denied them formal administrative or advisory roles until women's suffrage became reality and he saw the writing on the wall. While Young and many principle donors and staff members are profiled, the inmate sketches are really the heart of the book. Williams skillfully and colorfully weaves the life stories of these old veterans into the narrative, even giving them knicknames. Not surprisingly, some men fit in well with the rather strict military style routine, while many others struggled with the discipline required, abstention from drink being particularly difficult. The home itself was luxurious by most accounts, not surprising given its first life as a resort hotel. Williams describes the building in detail for the reader, and follows the expansion of the buildings and grounds up to the near disastrous 1920 fire. Rebuilt, but no longer beautiful, the more institutional appearing home operated until 1934, when the leanness of the Depression years, in conjunction with the passing of the Civil War generation, no longer allowed for the public funding of a retirement home with more staff than patients. Rusty Williams's My Old Confederate Home demonstrates how the Kentucky Confederate Home in Pewee Valley was forged and maintained through a mutually beneficial partnership between government and private organizations. By profiling a shining example of how societies can and should honor and care for veterans in need, it highlights important lessons for present and future generations. Dimitri Rotov had a wonderful post years back (apparently irretrievable by Blogger's atrocious search box, as I cannot find it) in which he gently mocked the internet surfer's all too often complete lack of compunction in intruding upon individuals they don't know, seeking their free "expert" advice. I do not collect antique Civil War books, nor have I ever claimed any expertise or really much interest in them at all, yet many of the emails I get from individuals consist of someone wanting me to appraise (or relate "what I know" about) this or that mid to late 19th Century Civil War book. For those that know how to properly address a stranger from whom one is requesting a favor, I try to do what I can, which usually isn't much at all given my lack of knowledge. Sadly, those types of missives are the minority, with most consisting of rudely insistent and crudely written demands that just make me shake my head. I would hate to be a customer service rep. The most recent one I had lacked a salutation and just listed characteristics of some old CW book I'd never heard of. I didn't answer as no question was even asked. The next morning the same person emailed me with an all caps demand that I immediately share all I know about the book. It's quite obvious these people are not my readers, more likely clueless relatives looking to see how much grandpa's dusty old book is worth and finding me (lucky me) on Google. Even the ones I can help rarely take the time to thank me. I would send these people to Paul Taylor if I disliked him. 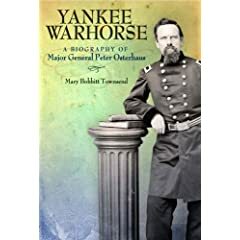 Townsend: " YANKEE WARHORSE: A Biography of Major General Peter J. Osterhaus "
As with the native variety, the quality of ethnic generals appointed by the Lincoln administration varied widely. Born in Rhine Province of mixed German-Dutch ancestry, Peter Joseph Osterhaus clearly proved to be more of a help than a hindrance to the Union military effort. Beginning with the first battle of Boonville, Missouri in 1861 and ending with the capture of Mobile, the German immigrant proved to be a solid, if unspectacular, regimental, brigade, division, and (briefly) corps commander. It is this military career that comprises the main thrust of Mary Bobbitt Townsend's Yankee Warhorse: A Biography of Major General Peter J. Osterhaus. Civil War biography written by descendants often rightly gives readers pause, and while Townsend, the general's great-great-granddaughter, does provide a generally celebratory account of her ancestor's service, she does offer criticism of Osterhaus when warranted. Osterhaus's leadership and combat experience in the 1848-1849 revolutionary uprising in the German state of Baden, described briefly but very well by Townsend in an early chapter, allowed him to adjust quickly to military life and perform competently in the early fighting in the Trans-Mississippi, at places like Boonville, Wilson's Creek, and Pea Ridge. His results during the Vicksburg Campaign as a division commander were mixed, with some viewing his performances at Port Gibson and Champion Hill as indicative of an overcautious nature. While Townsend does give some credence to these views, she does make a determined effort to defuse the criticism. She puts forth some good points, but there really isn't much excuse for this failure to sweep away Confederate resistance on his front at Port Gibson. Similarly, at Champion Hill, it is difficult to conceive of any reasonable explanation for III Corps's inert stance with a battle raging nearby, although most of the blame surely lies with Osterhaus's superior John A. McClernand. Ironically, Townsend's best and most detailed rendering of Osterhaus's role in a single battle recounts one of his worst days, Ringgold Gap, where he was surprised and manhandled by Patrick Cleburne. However, his overall career made for a positive contribution to the Union's war effort, and Yankee Warhorse also delves into Osterhaus's role in the Atlanta Campaign and the March to the Sea, as well as the final blow at Mobile. According to Townsend, little remains of Osterhaus's papers (a glance through the book's bibliography reveals only a single cache residing in the Missouri Historical Society at St. Louis), so we are left with relatively few personal insights. The author's contention that Osterhaus, compared to other high ranking ethnic officers, was unusually apolitical is thus difficult to assess. The bibliography itself is fairly extensive, but one would prefer that it be properly categorized. Some discussion of the German-language sources used might also have been enlightening. Curiously, the general also might serve as a supporting example for historian Christian Keller's thesis that the Civil War was not a significant promoter of assimilation for the Germans. Osterhaus often spoke of himself as an outsider (but without resentful tone in his writings) and left the country soon after the war, living in France and Germany for the rest of his days. He died in Germany in the middle of the Great War at the age of 94, apparently finding little problem with Kaiser Wilhelm's militant autocracy and, to the end, fervently hoping for an American alliance with Germany rather than the more democratic Entente powers. On the other hand, perhaps failing health and dotage can account for this seemingly contradictory stand. An important figure in the battles and campaigns fought in the western and Trans-Mississippi theaters, Peter J. Osterhaus is certainly worthy of a modern reassessment, and Mary Townsend's solidly researched biography and detailed treatment of the German-American's military career is well worth reading. 1. Roughshod Through Dixie: Grierson's Raid 1863 by Mark Lardas (Osprey Publishing, 2010). I believe this will be the first Civil War book in Osprey's Raid series [ed. actually there is one about the Andrews Raid]. 2. Edmund J. Davis of Texas: Civil War General, Republican Leader, Reconstruction Governor by Carl H. Moneyhon (TCU Press, 2010). 2nd entry in TCU's Texas Biography Series. Anyone interested in prominent southern unionists will want to read this one. They also have a "Rip" Ford volume in the works. 3. The Maps of Gettysburg: An Atlas of the Gettysburg Campaign, June 3 - July 13, 1863, Revised Full Color Edition by Bradley M. Gottfried (Savas Beatie, 2010). For this new publication, the maps are reproduced in color and the first ed. errata corrected and incorporated into the text. 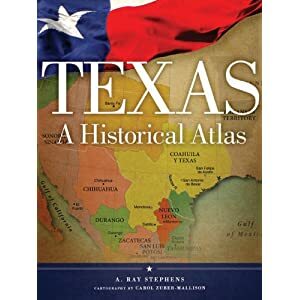 Stephens & Zuber-Mallison: "TEXAS: A HISTORICAL ATLAS"
Back in 1989, University of Oklahoma Press published the Historical Atlas of Texas by A. Ray Stephens and William M. Holmes. Now, with a new cartographer, a vastly updated and expanded edition titled Texas: A Historical Atlas has been released from the same publisher. Dwarfing the prior work in size and quality of presentation, Stephens's new creation is a thick, oversize tome, highlighted by 175 full-color maps (all on glossy paper) designed by cartographer Carol Zuber-Mallison. The work is divided into three main sections. The first part covers the natural world features of the state, such as its geology, hydrology, rainfall, weather, and flora. Part II features Texas Indian tribes, European and American explorers, and Mexican Texas. From there, it moves on through the Texas Revolution, independent republic, and early statehood eras, before concluding with the Civil War, Reconstruction, and additional political and economic events throughout the late 19th century. The last section deals with modern Texas and all that comes with it -- hurricanes, military bases, rivers, ports, railroads, parks, the oil, gas, coal, and cattle industries, farming, education, business, immigration, tourism, and current political boundaries. While one may question the lack of coverage or emphasis in certain areas, it's all in there to some degree or another. With extensive explanatory narrative by Stephens, and numerous supplemental charts and tables, the maps do not lack context. Photographs are also spread liberally throughout. While the text is not formally documented, a list of sources is provided in the bibliography, organized by chapter for easier reference. Of course, with such a project, important parties and events are inevitably given short shrift, and, given the venue within which this review appears, the Civil War years provide a rather glaring example. Given the conflict's enormous size, importance, and consequences, it is rather surprising that in a historical atlas only a single short chapter out of 86, totaling four pages and two maps, is devoted specifically to the Civil War. This is especially unfortunate in that the deficiency only reinforces the mistaken general perception that little of consequence happened within the state's borders during the war. Nevertheless, Civil War readers comprise only one audience for the book, and, taken as a whole, Texas: A Historical Atlas is a stunningly beautiful and well crafted visual journey through the entire length of Texas recorded history up to the present day. It will undoubtedly make its way into libraries and personal bookshelves throughout the state, and deservedly so. "Tennessee's Civil War Battlefields: A Guide to Their History and Preservation"
With so many battles large and small fought within the borders of Tennessee, guidebook authors will never lack for material. 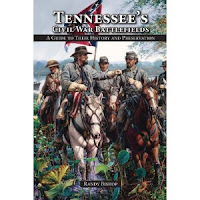 Randy Bishop's Tennessee's Civil War Battlefields: A Guide to Their History and Preservation [(Pelican Publishing, 2010). Softcover, maps, photos, notes, bibliography, index. 456 Pp. $25] is more comprehensive than most, devoting nearly as much attention to the comparatively obscure as it does to the great clashes. Chapters cover Ft. Henry, Ft. Donelson, Shiloh, Island No. 10, Britton's Lane, Davis Bridge, Hartsville, Salem Cemetery, Parker's Crossroads, Murfreesboro, Thompson's Station, Knoxville, Chattanooga, Ft. Pillow, Johnsonville, Spring Hill, Franklin, Nashville, and more. As one might guess from the book cover and the battle selection, General Forrest's exploits figure large in the author's interpretation of the war in Tennessee. Each chapter provides a general outline of the events of each battle, combining narrative with excerpts from Union and Confederate participant accounts. Preservation efforts at each site are also discussed, specifically crediting important individuals and organizations. As a general rule, readers will not find Bishop's book wanting in the provision of visual aids. While the reproductions can be a bit faded in places, the cartography is far better and more detailed than what one normally finds in broad themed Civil War guidebooks. All are creations of Blue & Gray's David E. Roth, and are adapted from the feature articles and tour guides from his fine magazine. In addition to the maps, a multitude of period photographs of persons and places, as well as images of modern landscapes, are included. Tennessee's Civil War Battlefields provides a solid popular guide to the history and preservation of sites located across the Volunteer State. In addition to its coverage of the larger and better known battles, it also draws reader attention toward many smaller but just as important plots of hallowed ground under threat from modern development.